From the office to manufacturing most businesses use a wide variety of small but essential items from data sticks to small parts and tools it can be hard to keep track of these smaller items. Due to their size, it's far too easy for these items to be mislaid or even stolen, but there are simple and effective ways to keep track of and deter theft. A low tech solution can be to simply etch or mark your items, this is probably fine for personal items, but not for business. In business, you need a consistent method that offers a professional solution that can easily expand with your business needs. 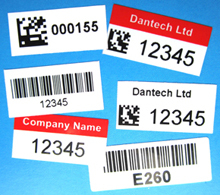 Dantech has been working with businesses to help them find the right security and asset labelling solutions and offer a range of small item tracking solutions. Text and information engraved into the surface of Acrylate giving a permanent high contrast, durable and tamper-proof image suitable for all environments. High-performance industrial adhesive suitable for most surfaces which will give high initial adhesion. Will withstand temperatures from –60ºC up to +200ºC - safe in a microwave, dishwasher, and autoclave. Highly resistant to chemicals, abrasion, and harsh environments. 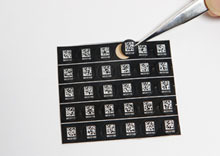 QR code and Data Matrix labels for Small Parts, Tools, and Instruments. 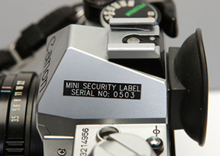 Data Matrix Asset labels use matrix codes that have a large data capacity, high density, and automatic error correction and even if partially damaged the code can still be read. Withstand temperatures up to 150°C short term.